First, make puree: Combine 2 cups of ripe mango, ½ cup water, and 2 Tbsp sugar. Put in a blender or use stab mixer and process for a minute or until a puree consistency is reached. Make sure all lumps are gone. Warm dissolved gelatin in the microwave for 10 seconds or on the stove just until all particles have melted but do not let it boil. Add gelatin and powdered sugar to the puree and mix well. In a big bowl, using a hand or stand mixer, whip mascarpone for a minute, while continuously whipping add the cream slowly until it becomes fluffy and stiff peak form. Using a spatula, slowly fold the puree mixture into the cream until well incorporated. Assemble the cake: Divide the sponge cake into 2 layers. Using a springform or a cake ring that is wider than the cake, leaving 1-2 cm space between the edges of the cake to the ring, place the first layer in the middle. 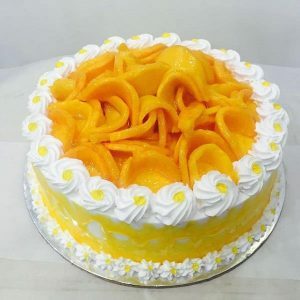 Scatter the remaining mango cubes on top of the cake. Pour the cream mixture until the mango cubes are covered. Place the next layer of cake on top. Pour the remaining cream covering the cake completely. Chill the Mango cake in the fridge for at least an hour or until it has set completely. Run a warm knife at the sides to separate the cake from the ring easier. Design as desired and serve while cold. Combine water and sugar in a saucepan and heat on medium-low stirring continuously until sugar has completely dissolved. Remove from heat when it starts to simmer then add the dissolved gelatin. Stir until the gelatin has completely melted and no longer visible. Add the mango puree and let cool at room temperature. Once it has cooled down, pour the mixture slowly on top of the chilled mango cake that is still in the ring, completely covering the top. Allow to set for some minutes or put the cake back in the fridge so it can set faster.